The numbers are inescapable: Dec. 14, 26 dead, five years. Those are the basic grim numbers behind the Sandy Hook Elementary School shooting in 2012 in Newtown, Connecticut. Newtown is where the political became personal. “We decided to not refer to it as an anniversary,” said Msgr. Robert Weiss, pastor of St. Rose of Lima Parish in Newtown. “We choose not to celebrate. We’re going to have a Mass of remembrance. I asked him (Bishop Frank Caggiano of Bridgeport, Connecticut) to be the celebrant. It’s still quite emotional for me. I know this is going to bring more attention than the three-or four-year” interval after the tragedy. Msgr. Weiss had been pastor at St. Rose 13 years at the time of the shootings, carried out by Adam Lanza, 20. He fatally shot 20 first-graders and six adults at the school, before shooting himself. The priest had funerals for eight of the victims at the church, and had a private funeral for a ninth child of split Catholic-evangelical parentage. Within a year, both of his associate pastors had been transferred. So had the school principal. Other civic leaders in Newtown, elected and unelected, also had moved on. “I’m going to stay,” he said he resolved, until his retirement from active ministry. “We can legislate all these gun laws and changes, but guns will always be available,” Msgr. Weiss told Catholic News Service in a Nov. 28 telephone interview. “You never hear the mental health issue anymore on the federal and state level. Just about everyone (responsible for mass shootings) has proven to have mental issues. “We’re really screwing up, not taking care of that situation. I think people are more and more stressed, being more and more medicated,” he continued. Stress? Msgr. Weiss knows something of that: He never needed eyeglasses before, but the enduring stress of Sandy Hook had an effect on his vision, and his hearing as well. On the congressional level, action is slow. A Nov. 9 letter to House leaders on both sides of the aisle urged Congress to take action to ban the purchase and sale of assault weapons, establish universal background checks and close the private-sale loophole, oppose reciprocity legislation that allows concealed-carry permit holders in one state to have the same privileges in other states, enact a law to bar the purchase or possession of firearms when deemed by a judge to pose a danger to self or others, and to close what is known as the “boyfriend loophole,” which allows convicted abusers and stalkers to buy and own firearms. Among the Catholic organizations in Faiths United to Prevent Gun Violence, which wrote the letter, are the Catholic Health Association, Catholic Health Initiatve, Catholics United, Catholics in Alliance for the common Good, the Franciscan Action Network, the Leadership Conference of Women Religious, the Catholic social justice lobby Network, Pax Christi USA and three women’s religious orders. Indiana is one state that bans possessing or carrying a handgun by someone convicted of domestic battery, although possession is a misdemeanor and someone can ask for the right to be restored five years after conviction. Maryland passed a law in 2013 in response to Sandy Hook, putting a 10-round limit on gun magazines and banning 45 kinds of assault weapons. The 4th U.S. Circuit Court of Appeals upheld the law earlier this year. On Nov. 27, the Supreme Court chose to not hear an appeal, leaving the law intact. Two Maryland lawmakers have said they want to pass a bill to ban bump stocks, the device that speeds up the firing of semiautomatic weapons; a dozen were attached to guns used in the Las Vegas concert massacre that killed 59 and wounded hundreds more. Assault weapons were used at Sandy Hook, and at a Baptist church in Texas this fall that left another 26 dead. A new study on gun ownership showed some out-of-the-ordinary details on how much faith owners have in their weapons. “Politically conservative gun owners feel more empowerment from their firearms than liberals,” said the study, “Gun Culture in Action,” by F. Carson Mencken and Paul Froese, published online Nov. 20 by the academic journal Social Problems. Rural dwellers also feel greater attachment to their weapons. Gun owners are, on average, more likely to be white, male, married, older and rural, and have good incomes but less education. Froese said they also tend to be more alienated from society. Those who are most empowered by guns said the weapons give them a sense of power and control over their lives. Women and minorities who own firearms do not place as much importance on them. One segment of gun owners, though, labeled “insurrectionist” in the study, believes it would be morally justifiable to take up arms against the U.S. government. Silk said the shooters’ inability to be aware of their deteriorating mental condition is a factor. Anger and rage are “well within normal human behavior. But I think what we’re looking at (is) where the anger turns to rage and the rage turns to some kind of violence.” With mental health coverage in many employee health plans, not everyone who seeks treatment should be considered a potential shooter. “In most cases those who had been convicted of some kind of violence, I don’t know. Aren’t they already turning in their guns? I’d like to think so!” Silk said. What is noteworthy is the sense of loss. 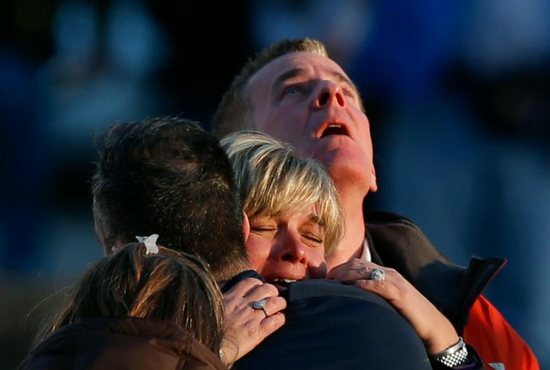 Parishioners with no connection to Sandy Hook come to Msgr. Weiss for counseling, and he said he has to remind himself they deserve the same level of pastoral care he’s given to surviving family members. He added children whose siblings were murdered at Sandy Hook, are now, years later, expressing feelings of abandonment because parents have spent so much time doting over their dead children.